Christening Plate is a beautiful hand painted plate, which we personalise specially for your Baby's Christening. 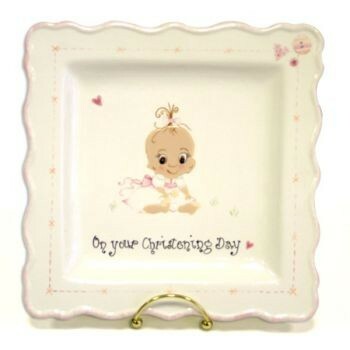 As these plates are exclusive to BabiesBabies & each one is hand painted to order, we can put your own message onto it. For example - On Your Christening Day Hannah 12th August 2017. Each plate is provided with a special pen & Instructions to write your own messages onto or simply just leave it as it arrives and put into baby's room as a keepsake from his/her Christening day. These are high quality plates with a pretty decorative edge. Your plate will arrive complete with a stand & care instructions. Please allow 7 days for the painting & glazing process. The photo shows our little girl plate, but please select below if you would like a boy plate. Please enter your personalisation details into the text box below.